Mondays are best when you are out of town, off-work and with family and friends. Today was one such Monday! After an early breakfast with my parents and running a few errands, it was time to head for lunch. I was biased towards something exotic. I had heard about a new Ethiopian restaurant which had opened at Chanakyapuri, however "democracy" prevailed(! 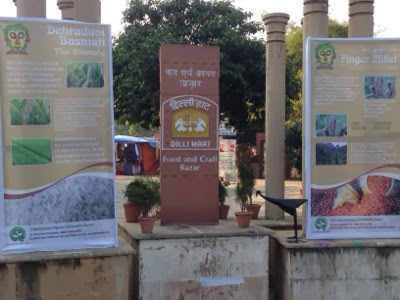 ), and bowing to wishes of the majority, we headed to Dilli Haat, the food and craft bazaar in South Delhi! 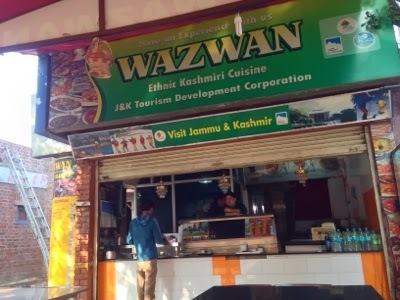 And that's when I saw Wazwan, the food stall from the state of Jammu & Kashmir! The area was basking in the soothing warmth of the afternoon winter Sun. 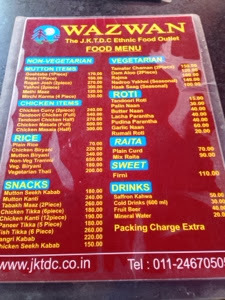 We seated ourselves on a table that was in the sun and scanned the menu with a hawk's eye. 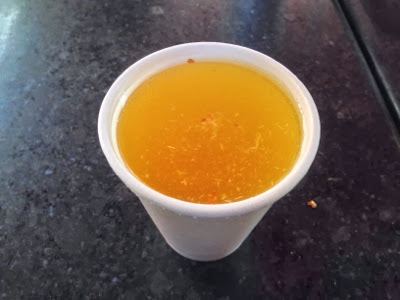 The mighty task of ordering was "outsourced" to me (probably as a consolation for junking the plan to head to Chanakyapuri for an Ethiopian lunch!). Not to be out-done, I had a field day ordering stuff that I thought I would enjoy! This was the second time I was going to have Kashmiri cuisine. The first time was memorable - it was October 2004, in the lawns of The Lalit in Srinagar, where a Wazwan buffet was laid out for us... It was a classy affair. 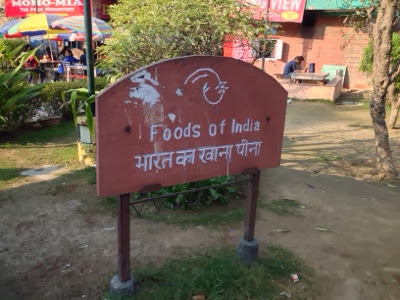 I ate and ate, till I couldn't anymore, as they say in Hindi, पेट भर गया पर आँखें नहीं भरी!!!! Now Wazwan is a multi-course Kashmiri meal, a communal dining tradition, typically for weddings and festivals. Guests are seated in groups and they share the meal out of a large metal plate, while being served by attendants. The delicacies served are mainly meat dishes, simmered and smoked on outdoor wood fire. The Wazwan preparation and serving is considered to be an art in Kashmiri culture and identity. 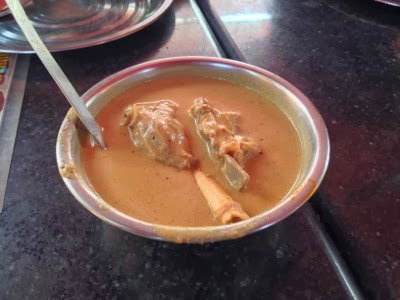 Usually, Pandits do not eat meat, however Kashmiri Pandits are an exception, though they avoid beef. Even the Kashmiri Muslim cuisine, in deference of Hindu customs, traditionally avoided the consumption of beef! However, they voraciously consume lamb and mutton, even chicken and fish are rare. So I took the liberty ordering a melange of mutton dishes. This first was Yakhni - lamb shanks cooked in curd based gravy with fennel (saunf) and cardamom! For Neelima, the only vegetarian in our group, I suggested rajma (red kidney beans), but she opted for dum-aloo and haak saag! 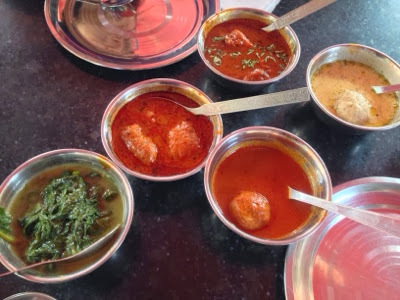 We also ordered rista - meatballs in red curry, goshtaba - meatballs in yogurt curry alongwith chicken curry. I quite enjoyed the haak saag or Kashmiri spinach - it had a unique flavour probably rendered to it by the mustard oil in which it was cooked! The meatballs were tender and springy - the mince used to make the meatballs is handground and that gives them the unique texture! 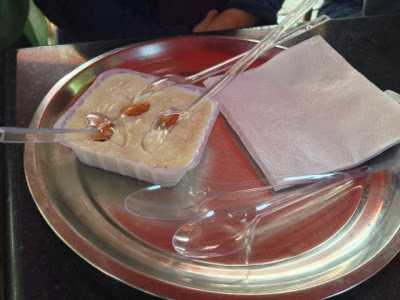 We ended the meal with some phirni which was rather nice, and not too sweet! We ended our meal with zaffran kahwah - Kashmiri green tea with saffron, almond and walnut slivers and cardamom! The kahwah was refreshing! 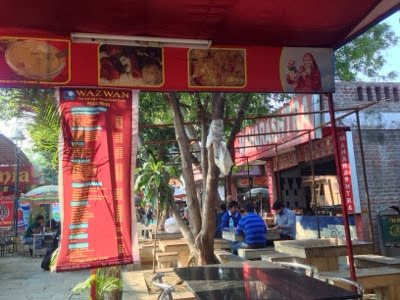 Though, I wouldn't rate Wazwan at Dilli Haat very highly, simply because there were no tabakh maaz and the portions were meagre, I did enjoy the meal. I resolved that there will be more evenings dining out at Goregaon's Kong Poush, when I return to Mumbai! I ended the meal with a salute to the centuries-old Kahmiri culinary traditions! Wah Wazwan!